We Ayers family writer dogs of Surf Dog Diaries, started out as windsurfers, back in the early 90's in San Diego. We moved up to surfing waves at Dog Beach, four dog generations ago. Our heart and soul lives at Dog Beach in Ocean Beach. It's where dogs and their people, from all over the world, play in sand and surf. Every waking moment, you hang 20 toes there. They can be so slow in the morning, before coffee. You roll by Roberto’s drive-through taco stand, two blocks from Dog Beach. Ah - the smell of carne asada... makes my neck hair stand up - in a good way! You tip-toe barefoot across 25-foot paw prints... up the Dog Beach entryway... past palm trees in the sand. Surf dog sculptures stare down at you - from way up there, above your doxie brains. Those rustic looking surfboards are taller than the biggest human you've ever met! You and your human share a wave - a beach - a community of dogs and dog people. Life begins again at Dog Beach. For years, we called Ocean Beach home – one of the last true funky beach towns in So Cal. Who were "we," Surf Dog Diaries peeps back then? Well, mom for one, Barb Ayers, a human windsurfer, and Chairperson of the Dog Beach Committee of the Ocean Beach Town Council. 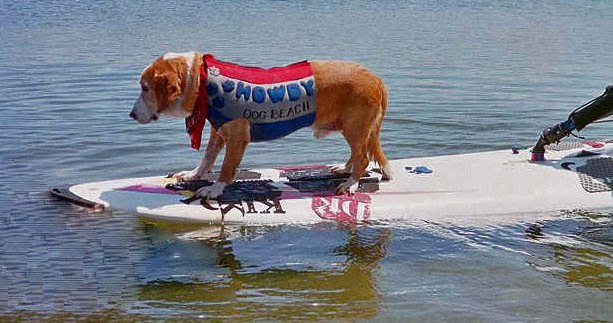 And on our non-human side, was surf dog grand daddy Howdy Doody. He was a rescue mutt, and he and mom did everything together. Howdy and my mom had everything to do with making this place the way it is. They co-chaired the Dog Beach Committee and managed the Dog Beach Improvement Project. I'm so proud to carry on the surf dog legacy - and Howdy Doody's name. Check out Dog Beach from the air on your next San Diego flight - the view is best while you are taking off, seated on right side window seats. Back then at Dog Beach, almost no one had ever surfed with dogs. We know of, like, two total, before us. Both guys with guy dogs. Mom's not in this picture - Santa is - but she's out there in the water, paddling, swimming, getting Howdy into the surf... for our Dog Beach Sandy Claws event. Cowabunga Christmas style. Three dog generations later, I'm named after him - I'm Doodle, as in Howdy Doody. And in between was Dude, my beagle/basset brother who just went to heaven from old age. Howdy was #1. Like me, maybe, he started out a wild child. He kept running away. He was abandoned as a puppy, chained to a wood pit, left as coyote bait in the backcountry. San Diego Humane Society rescued him. He got adopted a couple of times but it didn’t work out. They called him an “incorrigible pet.” Which is, of course, street cred for being a surfer, right? "Our eyes met across the long, dark hallway at closing time on a Saturday night at the doggie singles bar... I picked him up - and we went home together." To Dog Beach, of course. For a G-rated "It's A Wonderful Life" kind of ending. 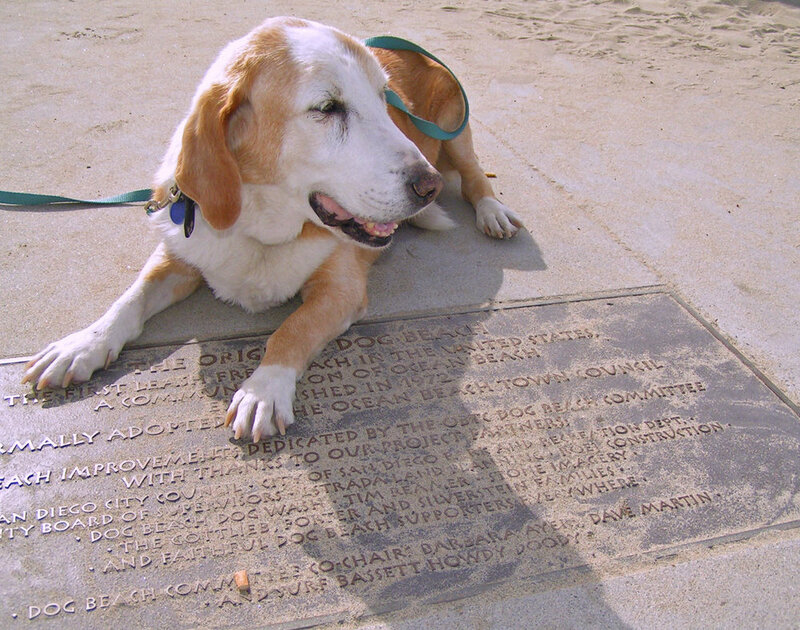 Howdy was a bassador – a basset/lab, with a long, low lab body and super low-rider basset hound legs. Low and slow - perfect for riding a surfboard. Like a lot of us rescue dogs, Howdy had abandonment issues. He hated being left behind, tied to the car as mom windsurfed away. So, one time when she came back to shore, he squeezed out of his collar and ran down to the water’s edge. He stepped up to the nose of the board. He looked back up the beach, at mom. Maybe kinda like they did that first night their eyes met. So of course, mom got the message. Duh! They could run away together! Later, they became national media stars, to help promote Dog Beach, get more people involved in fixing it up and helping fund the Dog Beach Improvement Project. Many dog years later, our dog/human family moved up to the big time of windsurfing - we moved to Oregon's Columbia River Gorge. Windsurfing Capital of the World!! This place is the real deal. An inland surf zone, with gnarly huge winds and big a$%^ waves on the Columbia River. Hanging out right above us are vertical cliffs (that's why the call it the Gorge) and this big a%^$ mountain - Mount Hood. Yeah- that Mount Hood. The one every year people climb up, then get stuck in the snow on, and have to get rescued from. That pic is 3 out of 4 generations of our surf dog family. Howdy is the only one not on board. Ok well, technically that's 5 gen's - with mom. She's totally a surf dog. Good thing someone invented Standup Paddle boarding (SUP.) My bro's and I paddle board when it's too gnarly up here to windsurf - or hang out at Dog River sandbar - our own Dog Beach. I windsurf here on mellow days with mom on our longboard- the same rig Howdy and Elvis and Dude windsurfed on over the years. Mom goes out on gnarly days on a short board, windsurfing by herself, while I hang on the beach. And we have a land board for doing parades and fundraisers, just like Howdy did. I'm the kid of the family - a doxie nose rider. Smallest and smartest - and, well, yeah, maybe the cutest, too. Not in a braggy way, but more of a "I still act like a puppy, even though I'm not one" cute kind of way. I had to learn how to surf, too. Elvis, my basset bro, showed me how. He rode the nose for years but then he got old and got to be more laid back. He's was my BFF. 2nd generation, after Howdy - the only one with his own name. My heart aches for him these days, RIP Elvis. You're always on board with us. Miss you, old friend. Surfing is all about the ride. Sometimes it's up - sometimes it's down. Sometimes you have to work really hard to make it work -- like it was when Howdy and my mom and everyone else back in Ocean Beach dreamed up, then put together, the Dog Beach Improvement Project. That took more than 10 years - 70 in dog years - to go from from idea to ceremony. Now, that's a ride. A lifetime in dog years! What you do together, with your neighbors, giving back - really makes a difference. Mom and I still fly back to surf our old home beach in San Diego. Where Howdy’s name is stamped in the entryway plaque. He was and is the bassador Ambassador of our old home beach. RIP Howdy. Doody- your legacy lives on! We stand on the shoulders of those that came before.